It starts in a swamp, and ends on a beach. It has no mountains, but it is the most botanically diverse trail in the United States. The Florida Trail stretches 1,400 miles across two time zones in a single state. In October 1966, a small group of trailblazers began building the first 26-mile section of the Florida Trail through the Ocala National Forest. The Florida Trail is a designated National Scenic Trail, one of eleven in the United States. It stretches from the edge of the Everglades between Miami and Naples to the western tip of Pensacola Beach at Fort Pickens. It provides a linear recreational resource within an hour of millions of Floridians, with hundreds of trailheads and primitive campsites. During the 50 years preceding publication of this book, thousands of volunteers spent millions of hours creating and maintaining the Florida Trail, a unparalleled public recreation resource for both Floridians and visitors. This limited edition coffee table book showcases the Florida Trail’s many natural wonders while recounting its history: the trail’s creation, the effort to become a designated National Scenic Trail, the stories from the earliest hikers to walk from one end of Florida to the other, and the paralleling history of the volunteer organization that made it happen, the Florida Trail Association. Published Fall 2016 in conjunction with the 50th anniversary of the Florida Trail, this is a limited edition coffee table book and will not be reprinted. We published 250 hardcover copies, each of which is signed by the authors and and numbered. To establish a version at a lower price point, we also published 700 softcover copies. Less than 500 softcover copies remain in stock as of July 2018, and less than half of the hardcover edition. It is an ideal gift for outdoor enthusiasts, conservationists, and those who love learning about the history of Florida. The casebound hardcover edition is perfect for libraries. 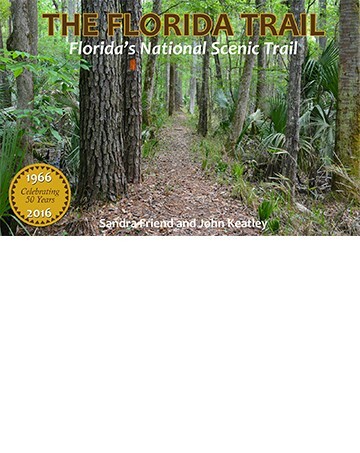 Foreword by Florida Trail founder Jim Kern. Full page 2016 map of the Florida Trail. A photographic walk through 1,400 miles of the Florida Trail. Florida wildflower photos with accurate identifications. Backpacking gear and trail tools of the 1960s, 1970s, and 1980s. Photo gallery of all Florida Trail System trails, with GPS coordinates to trailheads. Bibliography of all books written about the Florida Trail. Overview of all Florida Trail Association publications. Photos and stories from the first hikers to walk end-to-end on the Florida Trail. Photos and stories from Florida Trail thru-hikers. Historic blueprints for footbridge and boardwalk construction. Photos and timeline of FTA Presidents. Historic maps dating back as far as 1969. Gallery of 16 years of Florida Trail themed quilts. Florida Trail Association Chapters and when they were established. Patches issued by the Florida Trail Association. Afterword by Florida Trail president Carlos Schomaker. Six page index which includes identified individuals in photos. Interior spreads from The Florida Trail: Florida’s National Scenic Trail. Click to view. RETAILERS: The softcover edition of this book is available within the United States at a wholesale discount. Become a reseller.